In a remote Andean valley in southern Ecuador, at 3,000 feet, lies the small town of Vilcabamba. Most people visit the town on account of its reputation for having exceptionally long-lived inhabitants, many said to be over 100 years old. Once you are there it is well worth visiting the Area Nacional de Recreacion Yamburaro. 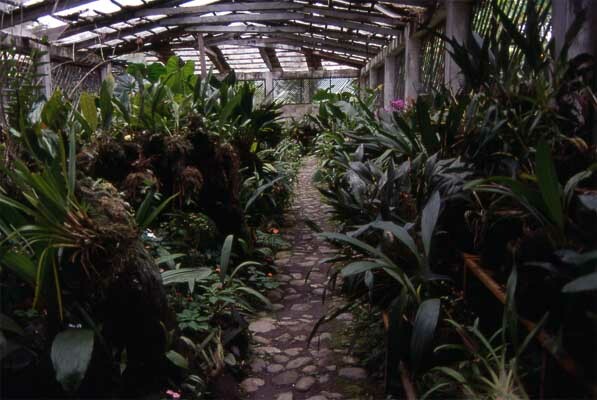 Here is a small zoo and an orchid house where over 300 species of orchids are being raised. The aim of the horticulturalists is to breed new varieties for sale to international markets. Proceeds from the endeavor will be used to help preserve local habitat and provide a sustainable source of income for local people. Several of the pictures in the orchid pages were taken here.